Our “Bahamas” Single Cotton Hammock is the perfect way to enjoy the afternoon breeze or lay under the stars. This cool cotton hammock cradles you for a relaxing experience. It measures in at 37” x 73” and generously supports up to 240 lbs. 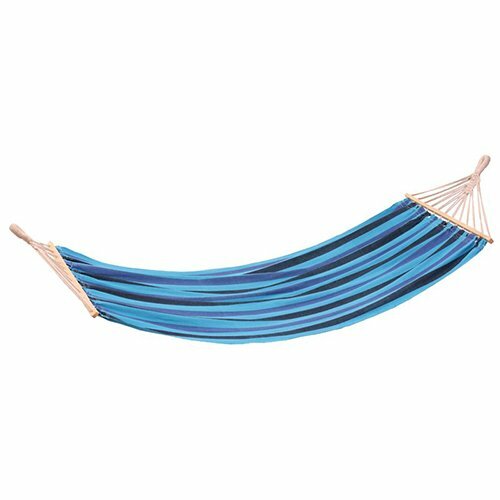 Its hardwood spreader bars make sure the hammock lays flat at all times, and assures you will not be “cocooned”. The bright colors give it an authentic Caribbean flair! So grab a book and grab a blanket and swing the day away in our “Bahamas” Single Cotton Hammock! Size: 78"L x 37" W, Weight capacity of 240 lbs.